Acceptable to wear OLD team kits? Feama, La Vie Claire, Molteni etc. Acceptable? If so how old does a kit have to be? Is it unacceptable to wear new ones? I like my clothes to be free of holes to be honest. Why would it be unacceptable to celebrate the history of the sport? Perfectly alright. I'm actually going to buy a San Pellegrino jersey. Why are professional team kits sold to the public if it's not alright to wear them? I personally don't get the fuss. IMO it's fine to wear a team kit, old or new. Jspear wrote: Why are professional team kits sold to the public if it's not alright to wear them? I personally don't get the fuss. IMO it's fine to wear a team kit, old or new. It's because it's associated with freds, hubbards, you name it. People new to cycling who, from dealing with other sports, feel the need to relate to a team. Sometimes it's also seen as someone showing excessive signs of fanboyism towards a rider of a certain team (for instance Fleur in a Saxo jersey ), or sunday riders pretending to be who they're not. It's also not very useful because if you want to enter some kind of race, from a crit to a medio/granfondo, you're not allowed to wear jerseys/bibs from a pro team still in the scene or whose sponsors still exist. I won't say I have a beef with it, I sometimes still use my Efapel jersey from the year of David Blanco, but that's about it. Otherwise my minimalistic Decathlon kit does the trick. Knock yourself out. I've always thought that classic kits are cool and can mark you out as someone who appreciates the history of the sport. I have an 80's design Puegeot kit I wear from time to time. Not sure if it's genuine but it looks good, fits well and gets comments. A friend has an early Fassa Bortolo kit that's the same. As for current kits, I'd rather wear my club/LBS kit and give them support but if you like a current team kit, go for it I guess. Those rules are just there so some people can feel smugly superior over other cyclists they see as being part of the lesser group, the "casuals", "posers" or otherwise to-be-despised individuals who should not be on bikes. With such low entry requirements, anyone can get on a bike, you need some kind of ingroup-outgroup categorization to be able to distinguish yourself from the pack of simpletons. Disclaimer: Don't take this post too serious, it's just my way to feel smugly superior over people who I feel are feeling smugly superior over others. Last edited by WillemS on 19 Jul 2015 15:25, edited 1 time in total. WillemS wrote: Those rules are just there so some people can feel smugly superior over other cyclists they see as being part of lesser group, the "casuals", "poser" or otherwise to-be-despised individuals who should not be on bikes. With such low entry requirements, anyone can get on a bike, you need some kind of ingroup-outgroup categorization to be able to distinguish yourself from the pack of simpletons. Cycling culture is the worst. All those rules that are semi tongue in cheek but secretly oh so serious make me cringe. At a local cycling event, I once observed a grown man on a bike talking to/insulting a boy* (eleven/twelve years of age?) in a world champion's kit saying the boy should not wear that and should have respect for that jersey and the "rightful" wearer. The terms the "grown" man used were a lot less respectful, though. Luckily the father of the boy just said something like "leave him alone", turned around and walked away. *) They were totally unrelated/total strangers, as far as I could tell. The best part about it was that the man was obviously intoxicated, but still astride his mid-life crisis Pinarello (he did not really look like a "serious" cyclists). Well, that's probably a former hubbard who had a hard time himself. Most cyclists I ride with don't like team kits but would never harass a child either. I think the father was very tolerant in that situation. Re: Acceptable to wear OLD team kits? http://forum.cyclingnews.com/viewtopic.php?f=21&t=8087 Thread: "Should you wear team kits?" Not fussed... I use some for commuting or weekend rides. 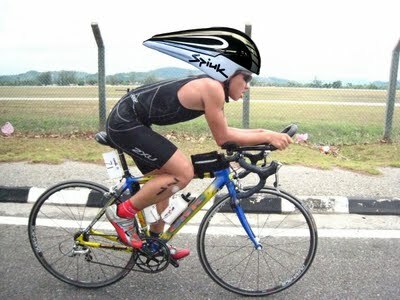 Funny story though - a guy rocked up to our monthly road race in full HTC kit a few years ago. Should have heard all the whispered "what a tool" type comments. That was until people realised it was Mark Renshaw that had rolled in. Archibald wrote: http://forum.cyclingnews.com/viewtopic.php?f=21&t=8087 Thread: "Should you wear team kits?"